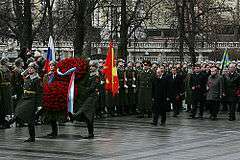 Wreath-laying ceremony at the Tomb of the Unknown Soldier in Moscow, 23 February 2008. Defender of the Fatherland Day (Russian: День защитника Отечества / Den' zashchitnika Otechestva) is a holiday observed in Russia, Belarus, Kyrgyzstan, Tajikistan, and several other former republics of the Soviet Union. It is celebrated on February 23, except in Kazakhstan, where the date is May 7. First celebrated in 1919 the holiday marks the date in 1918 during the Russian Civil War when the first mass draft into the Red Army occurred in Petrograd and Moscow (on 17 February). In January 1919 it was decided to combine the celebration that day with the anniversary of the publication of the decree on the establishment of the Red Army (of 18 February 1918). In 1919 February 17 fell on Monday; so it was decided to move the holiday to the nearest Sunday - 23 February. Since then it stayed that day. It was originally known as Red Army Day (Russian: День Красной Армии). In 1923 it was officially named the Day of the Red Army and the Navy. In 1949, it was renamed Soviet Army and Navy Day (Russian: День Советской Армии и Военно-Морского флота / Dyen' Sovyetskoy Armii i Voyenno-Morskogo flota). Following the fall of the Soviet Union in 1991, the holiday was given its current name in 2002 by Russian President Vladimir Putin who decreed it a state holiday (in Russia). 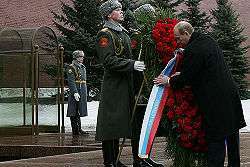 The 2008 holiday, with ceremonies being performed by President Putin. Officially, as the name suggests, the holiday celebrates people who are serving or were serving the Russian Armed Forces (both men and women, both military and civilian personnel), but unofficially, nationally it has also more recently come to include the celebration of men as a whole, and to act as a counterpart of International Women's Day on March 8. The holiday is celebrated with parades and processions in honor of veterans, and women also give small gifts to men in their lives, especially husbands (or boyfriends, fiances), fathers, sons and brothers. As a part of the workplace culture, women often give small gifts to their male co-workers. Consequently, in colloquial usage, the holiday is often referred to as Men's Day (Russian: День Мужчин, Den' Muzhchin). One of the holiday traditions in Moscow is a ceremony near the Kremlin, the laying of wreaths at the Tomb of the Unknown Soldier. The Russian President, the heads of both chambers of parliament, military leaders, representatives of other branches of government, heads of political parties as well as Russian Orthodox Church officials arrive at the Alexander Garden which is located near the Moscow Kremlin walls. After a moment of silence, national anthem is played and solemn march of an honor guard unit passes. In the evening, the country's leadership is present at a concert dedicated to the holiday on the State Kremlin Palace. Also in the evening in Moscow and in many other cities of Russia fireworks are displayed. In Kazakhstan Defender of the Fatherland Day is celebrated on 7 May. In Tajikistan, the holiday is known as Tajik National Army Day (Tajik: Рӯзи Артиши Миллӣ Тоҷик), celebrating the Tajik National Army. However, it has been known that other military units, such as the Tajik Air Force, have taken part in the celebration. In Ukraine, Defender of the Fatherland Day (Ukrainian: День захисника Вітчизни/Den' zakhysnyka Vitchyzny) was never celebrated as a state holiday. In 1999 President Leonid Kuchma recognized 23 February as Defenders of the Fatherland Day. President Petro Poroshenko deprived the day of this status on 24 August 2014; according to Poroshenko, Ukraine should not celebrate the holidays of the "military-historical calendar of Russia" but "will honor the defenders of our homeland, not someone else's". On 14 October 2014, a decree by Poroshenko moved the celebration to that day instead by creating the Defender of Ukraine Day. Today, even though it is not a public holiday, many women will still give some extra attention to male relatives, friends, husbands and boyfriends, especially to those serving in the Armed Forces of Ukraine. Armed Forces Day for the entire Armed Forces is celebrated yearly on 6 December with special programs and nationwide gun salutes and fireworks displays. The separatist Donetsk People's Republic and Luhansk People's Republic continue to celebrate Defender of the Fatherland Day. ↑ John Pike. "Tajikistan- Air Force". globalsecurity.org. Wikimedia Commons has media related to Defender of the Fatherland Day.